The story involves a beautiful Governor's daughter (Keira Knightley of Bend it Like Beckham) who is kidnapped by pirates; a swashbuckling blacksmith's apprentice (Orlando Bloom, Legolas from The Lord of the Rings) who secretly loves the Governor's daughter and endeavors to save her; and a foolish/brilliant (which is it?) pirate named Jack Sparrow (Johnny Depp) who attempts to foil the kidnapping plot - strictly for personal gain, mind you. The aforementioned kidnappers are the crew of the Black Pearl, a cursed ship with black sails that can out run anything on the seven seas. Its crew lives a twilight existence. During the day their scarred, tattooed, tanned bodies look normal enough, but in the glow of the moon, they appear in their true form - as skeletons with rotten flesh hanging from battered bones. They follow Captain Barbossa (Geoffrey Rush of Shine), the scurviest pirate to plunder a merchant ship. Several years ago, he stranded Jack Sparrow on a desert island, and now Jack wants to even the score. Watching Pirates of the Caribbean made me appreciate Raiders of the Lost Ark all the more. In Spielberg's film, he explicitly drew on the serial tradition, but he made the hyperactive pacing work by always keeping specific goals in sight. In contrast, if you try watching any of the films that resulted when classic serials, such as Flash Gordon, were edited down to feature length, you'll encounter arbitrary plot developments, a cacophony of noise, and a bewildering onslaught of motion. While Raiders of the Lost Ark was carefully paced, Pirates of the Caribbean goes on and on, delivering one sword fight after the next, one ship siege after another, in a rhythmically clumsy mess. Even Johnny Depp's performance is somewhat problematic. He hyperactively stays in perpetual motion; he's always twisting at the waist, his eyes are always rolling, his head is always tilting to the side. He gives us a unique and fascinating character, but someone needed to tell him that less is more. He could've learned by simply paying closer attention to Geoffrey Rush, who delivers a marvelously wicked performance. Rush's Captain Barbossa is a vicious character, but Rush conveys the menace with a modicum of movement. Meanwhile, Depp never stops "acting." Even while I was impressed with his extravagant approach to Jack Sparrow, every time he appeared on screen, I was reminded that I was watching an actor working extremely hard to impress his audience. And so goes this movie in general: director Gore Verbinski (The Ring) has fashioned a beautiful but overly complicated adventure yarn. He manages some great visuals, such as the living-dead pirates walking along the bottom of the sea as they head into battle (which evokes a somewhat similar scene from Douglas Fairbanks' silent-era classic The Black Pirate). Verbinski is clearly having fun here, as when he pays homage to the Disneyland thrill ride by staging a scene where prisoners in a jail cell try to lure a dog - which has the cell keys in its mouth - within their grasp. (Remember that scene from the ride?) But the storytelling lacks focus, and the plot twists like a wounded anaconda. Pirates of the Caribbean could've been a great serial. But the serial form doesn't really exist anymore, at least it doesn't exist in contemporary motion picture theaters anyway. The serial has been revived on television, but in motion picture theaters, all story ideas unfortunately must conform to the feature film format. 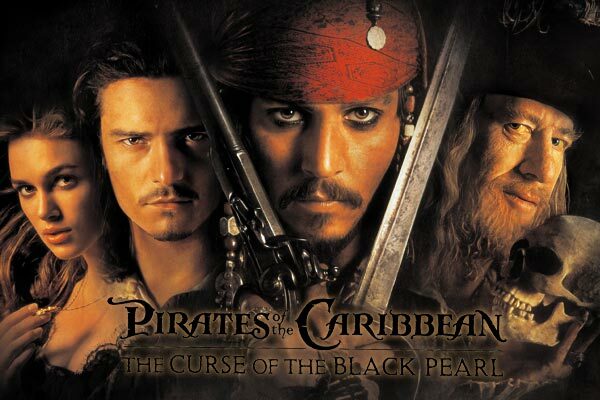 In Pirates of the Caribbean, the movie's team of writers (including of Ted Elliott and Terry Rossio of Shrek) devised enough plot for several films and then crammed it all into a single film. No amount of editing can fix this problem. Someone needed to stop the flow of plot developments, but no one seems to have had the fortitude to corral this mangy crew of headstrong buccaneers.